Resolver launches its newest cloud-based Enterprise Risk Management application at the upcoming GAM Conference, March 20-22 in Orlando, Florida. The provider of Risk and Incident Management software will showcase its latest cloud-based software products including ERM, Internal Audit, Compliance, and Incident Management at the upcoming Institute of Internal Auditors event. Resolver’s newest product release features an updated user interface that is fully responsive supporting seamless use with mobile phones, tablets, and desktop from any browser. Its thin design and ease of use is ideal for ERM, Audit, and Compliance where organizations are looking to push self-assessment to the employees who control the day to day operations of the business. The user experience is highly visual and easy to use, while providing features like extensive reporting and interactive dashboards, drill-down capable heat maps, visual relationship diagrams with real time links, as well as an open API to connect to other critical business systems. All the apps are fully integrated to Resolver’s incident management functions to support cause and effect reporting, and bow-tie analysis. All of this is part of Resolvers’ Integrated Risk Management strategy. Resolver’s newest ERM app features a prescriptive approach to the services implementation and is designed to provide best practices out of the box with immediate value. Organizations that have implemented the ERM app were running the product within 30 days, fully compliant to the most common frameworks. Resolver is attending GAM 2017, visit us at Booth #523. 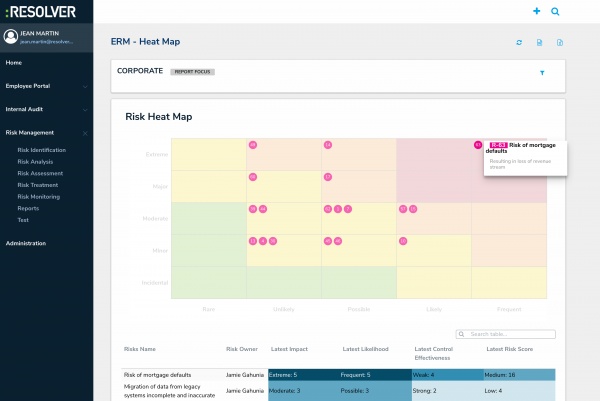 Our Integrated Risk Management platform is designed to plan and prepare your organization to limit the likeliness or impact of events from occurring; this includes Risk Assessment, Enterprise Risk Management, Internal Control, Internal Audit and Compliance. Our products also support the response and recovery process when an unplanned event does occur; including Incident Reporting, Incident Response and Investigations. Resolver’s team is comprised of security, risk and compliance experts supporting over 1,000 customers across 100 countries with offices in North America, United Kingdom and the Middle East, and Asia-Pacific.